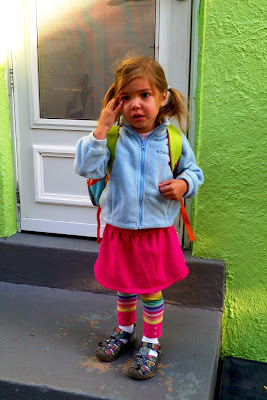 Going Mamarazzi: Hannah's second day of school! Montessori phases in the kids slowly so that the newest and youngest kids start last after the veterans have a chance to get their routine in swing. As such, Hannah was the last one in her class to start school this year with a scheduled start day of September 17. She didn't make it until that Wednesday though because on the night of Brandy's wedding (September 15), Hannah woke up at midnight coughing and gasping for breath. We let her sit on the couch for a while thinking that being upright would help with the wheezing, but it didn't. I rubbed a home-made imitation vapo-rub on her chest and back, but that didn't help either. 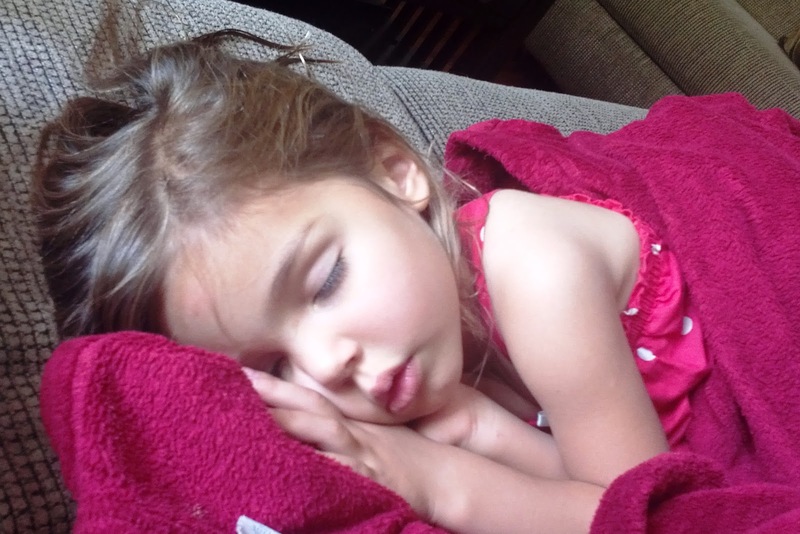 We gave her the homeopathic cough and cold medicine we have, but still nothing changed. Finally we took her to bed with us, plugged in the cool mist thing and attempted to sleep. Every so often the pause after an exhale would last a little longer than seemed okay, and Eric and I would bolt upright and shake her until she started breathing again. On three different occasions I dressed for the emergency room, but each time we decided to wait a little longer. At 6:30 that Sunday morning we took her in I put my foot down and said it was time to go. It turned out to be a pointless trip though. The doctor said she had an upper respiratory infection and x-rayed her chest to confirm the absence of pneumonia. They gave her some Tylenol and were dismayed when her temperature rose after that, but they let us go home anyway. They did nothing for her breathing and assured us that it was fine, that once the antibiotics kicked in, it would go back to normal. She slept in our bed again on Sunday night so we could continue to supervise her inhaling, and when there were still no improvements on Monday morning, I took her in to her pediatrician who gave her a nebulizer, steroids, and an inhaler. Her breathing normalized within a few hours. This doctor, when I told her that the ER did not seem at all alarmed, said that Hannah's breathing was so bad that her first thought was to send us back to the ER (a different one with a pediatric ward), but she opted to start with the neb and steroids. If those hadn't kicked in within the few hours that they did, we'd have been back in the ER, but fortunately that's all it took. Hannah's fever was low on Monday night and gone by Tuesday morning so we took one more lazy day and then started school that Wednesday. With all the hustle to get out of the house much earlier than we're used to, I forgot to get a picture of her, and I couldn't get one when we got back home because she spent the entire car ride home screaming bloody murder about wanting to eat in the car. I didn't bring her a snack because I knew I was going to give her lunch as soon as she got home. Sue me!! So there's no picture of Hannah on her first day of school, but here she is on the morning of her second day of school. Yes, she's crying again, this time because you can't see her kitty shirt with her jacket on....Sheesh! Who is this diva??? I assured her that she could remove the jacket once at school, but this didn't seem to make her feel better. In spite of tears on the first few days, she is loving school and even said tonight that she missed her teacher, Ms. Vicky. I love hearing her stories every day (though I have to pull them out of her rather painfully), and Eric and I are already noticing a lot of maturation in her. It was an exhausting first week of school which I suppose is to be expected when you've got a kid who is both recovering from a severe infection AND doing something huge like starting school. As a result, we had a super cranky kid on our hands most afternoons and evenings. On Friday I took her swimming after school, and that was the icing on the wipe-out cake. She actually passed out in the car on the 10 minute drive home. This kid never passes out in the car! Certainly not on a ride that short. Then she did something even crazier: she stayed asleep while I carried her from the car to the house. I am not exaggerating when I say that she has NEVER EVER made that transition in her entire life. 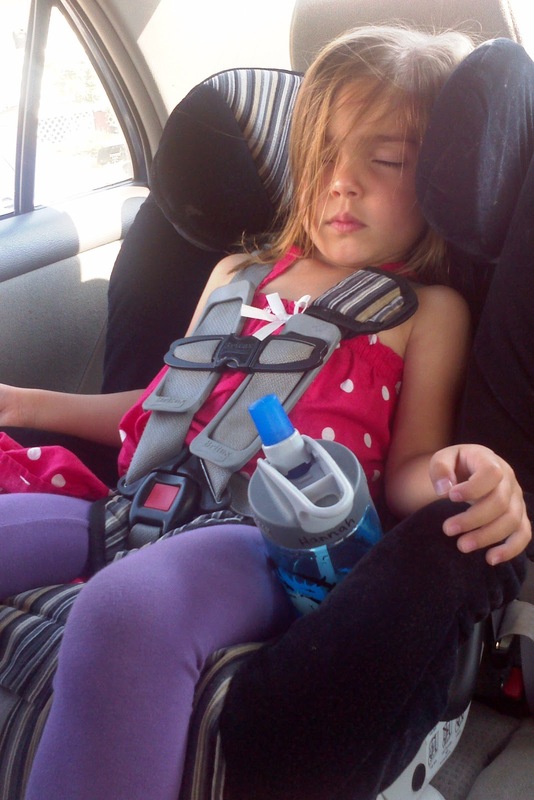 Even as an infant in the infant seat, the second I would pick up that seat, she would wake up, and if I didn't remove her from the confines of that seat within seconds, she was screaming about it. I laid her down on the couch and let her rest for about an hour before I woke her. We've bumped up bedtime by half an hour, and she's less cranky now, though it's still obvious that school is taking a lot of her. I was a little leery about her going to school 5 days a week at the age of 3, but I think it's good for her. I think she was getting bored with our routine and wasn't being stimulated enough. I'm loving the changes I'm seeing in her and am so happy that we chose Montessori! haha! Good idea Di!! The one my pediatrician recommended is GBMC, but that's because my pediatrician is in Lutherville so proximity is key...Union Memorial is where we've been going since they are the closest to our house, but they do NOT have a pediatric ER, so we'll probably switch to GBMC in the future. It'd be nice for there not to be a future though...we've already taken Hannah to the ER 3 or 4 times in her 3 short years of life...sheesh. I'm not sure of a downtown hospital that has a pediatric ER...I don't even know what hospitals are downtown other than Mercy....Let me know what you find! Always good to have backups!